For a girl living in a New York Brownstone with an absentee father, life can be tough. Luckily, have virtually unlimited trust-funds and a poltergeist nanny and butler make life considerably easier. But when mean-spirited strangers come to call, it’s going to take more than just her wits to keep her way of life intact…. “Ghost” was written by Julie Hoverson, contemporary audio drama’s most prolific diva, whose projects range from the genre-busting Dead-eye kid, to the ‘why even bother using words trying to explain it’ Bingo the Birthday Clown, plus straight up gorey, spooky, and mind-bending fare in her regular 19 Nocturne Boulevard anthology of unusual stories. 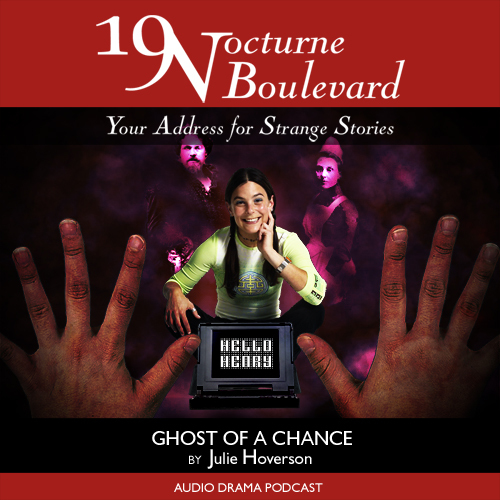 And while Julie does many classics (such as HP Lovecraft’s Rats in the Walls, just produced for this last Halloween), it’s her original work that shows off the true range of her talents. Expect the unexpected this week. Plus, news of a new radio drama adaptation of Neil Gaiman’s Neverwhere and the publication of The Cleansed by Blackstone Audiobooks. And the return of Captain Radio! It’s a pretty full 45 minutes. Just listened to this today for the first time and really enjoyed it thankyou.